Another sunny day in Anchorage. The plan today was to hike up one of the smaller area mountains called Near Point. 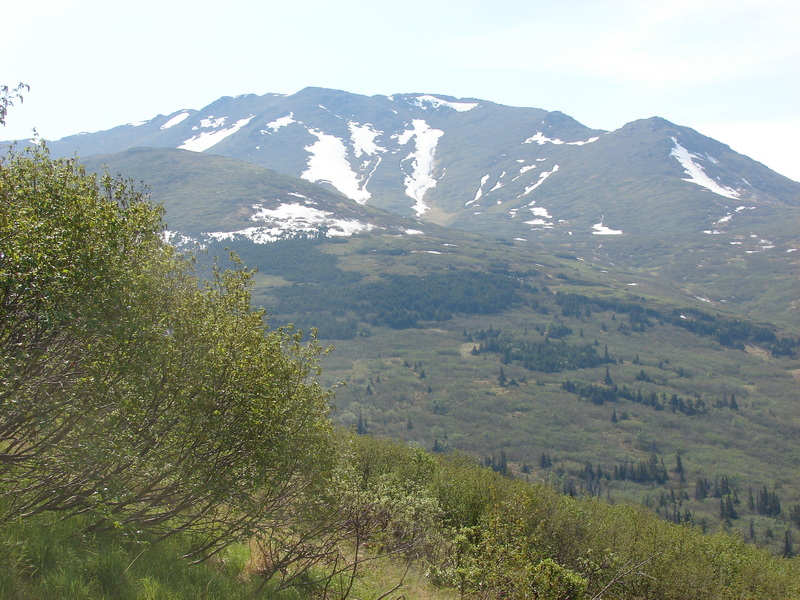 The trailhead is about a 15 minute drive from the nearest Wal-Mart and the peak is about a 2-2 1/2 hour hike from there. The reason I say its 15 minutes from the nearest Wal-Mart is to illustrate what can be experienced just out of town. The running joke is that Anchorage is 15 minutes from Alaska. Unfortunately Misty and Mosely are of the age where they are no longer able to hike with me and I couldn’t drum up a friend on short notice, so I hit the trail solo. Not an uncommon event. I just whistled every so often, especially when approaching blind corners and noisy water. To scare off the bears, don’t ya know. Both black and brown inhabit this area. 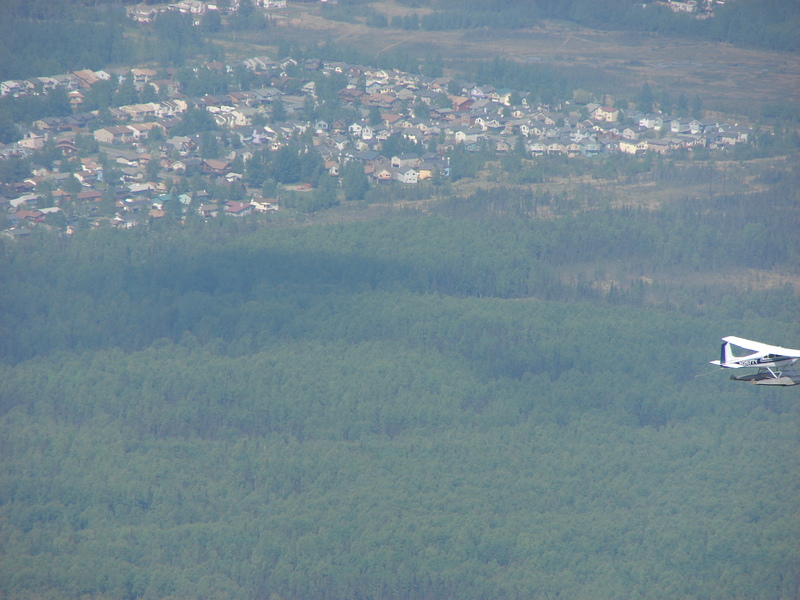 Anyway, as I said, it was another sunny albeit hazy day in Anchorage. The sun is quite strong up here, so lots of sunscreen as well as mosquito repellent were in order. Not to mention Bear Spray. 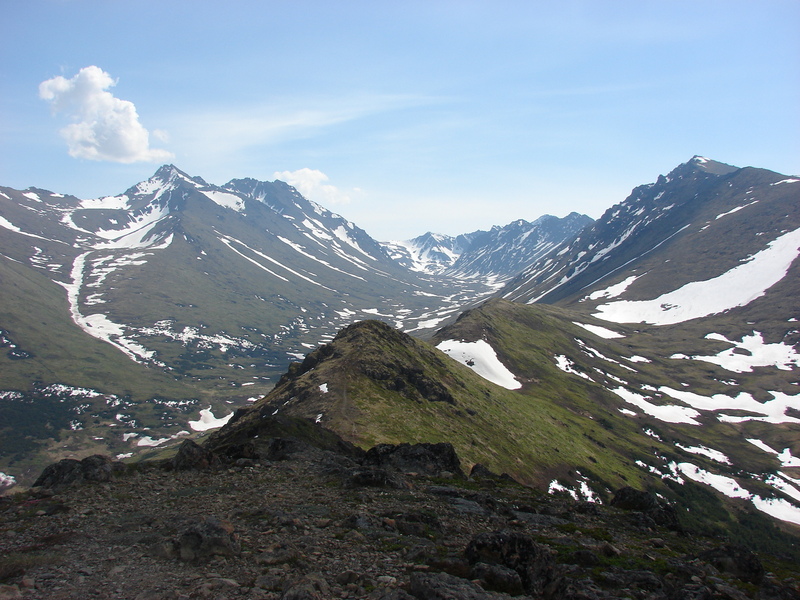 I’ll attach some photos below of the view from the top, the view part way up, and some alpine wildflowers (I can’t remember the name and can’t look it up since I sold my Alaska Wildflower book in my garage sale). There is also a picture of a float plane flying by. It is unusual to have a plane fly by BELOW you. 2 hours up and an hour back and no bear sightings. All morning and since being home, I’ve been listening to NPR which has had ongoing coverage of our men and women in the military both past and present. Happy Memorial Day. Could the flower be an Arctic Sandwort? I especially like the float plane photo. I’m sure you were armed with bear spray? Those bears are hungry! did you have your bear spray? Yes, I had my bear spray and have added that tidbit of info to the Post. Wonder why I didn’t include it in the first place. Have no idea what the flowers are….could be Arctic Sandwort, but that doesnt sound familiar. I’ll see if I can get a hold of a book to look it up. Beautiful photos–having lived here for 38 years, I never tire of its beauty. 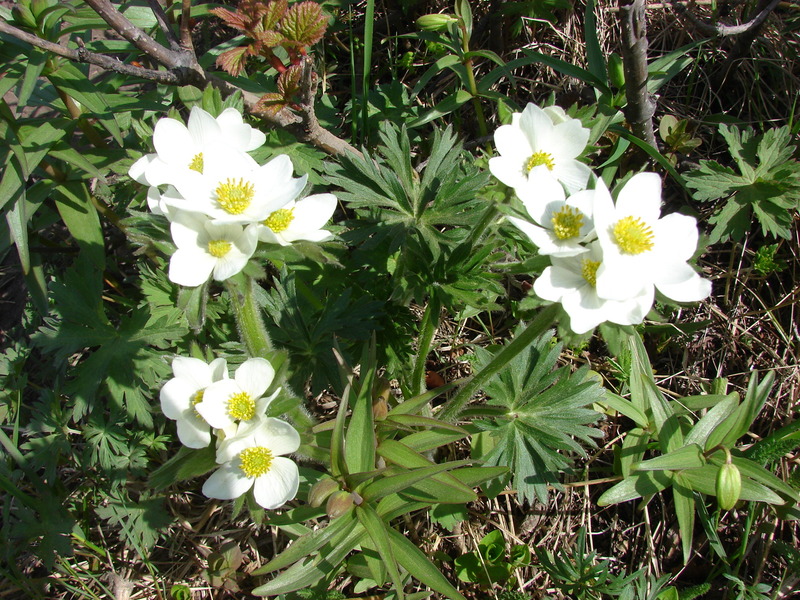 No longer have my Verna Pratt “Alaskan Wildflowers” book–gave it to son and family–so looked flower up online–could it be a Narcissus-Flowered Anemone? P.S. I live 3 miles from the same Walmart!…yes, Alaska is 15 minutes from Anchorage.